The presence of a recent Premier League name in the echelons of semi-pro football does usually heighten a bit of interest. I remember clearly the point when I realised non-league football wasn’t just drunks bursting out of their faded strips was when Havant Town signed the former Charlton striker Andy Jones in the mid-90’s. I never did make it down to, a then very different looking, West Leigh Park to see him play although I have been told since that when he came back for pre-season after his first year, part of my ignorant stereotyping would have been pretty accurate, given that his shirt-buttons looked a lot less relaxed than they had prior to the summer. As it was, Havant & Waterlooville signing former Republic of Ireland international Liam Daish that kick-started my regular H&Dub attendance, a ritual to which I was rapidly hooked. Dean Holdsworth’s year and a bit with us may also have flicked the switch with a few people. However I’m not entirely convinced it’s the same deal with ample-rumped Kidsgrove striker Trevor Benjamin, formerly of Leicester City, most famously, but who has made twenty-two debuts (including for Jamaica) since his first League appearance for Cambridge United in 1995, and yet is still only thirty years old. It certainly doesn’t appear that Trev wishes to be in the Unibond Division One South for any considerable length of time, despite his claims on signing in February that “I wanted to get back to enjoying the game, and I feel I can do this here.” He may not, of course, have any choice in the matter. After all, Grove are his fifth non-league club of the season, having had unsuccessful trials at Gillingham, Bournemouth and Cheltenham last July. Flat-cap model and Cherries gaffer at the time, Jimmy Quinn, remarked that Trev was “probably past his sell-by date,” a claim Trev would have undoubtedly refuted had he not been busy brushing a hirsute blue fungus from his upper body, and picking an adhesively stubborn ‘79p – REDUCED TO CLEAR’ sticker off his thigh. Rightly so on tonight’s evidence too, given that if it wasn’t for the fact he looks like the prematurely developed kid in the middle school class photo amongst this mob, he would have been pretty anonymous. Two goals in nine games (which was a brace away to Quorn) and one in eight shared between brief stints with Gainsborough Trinity, Northwich Victoria, Hednesford Town and Wellingborough Town this season is not an indicator to anyone that he’s ready to step back up. You could forgive Grove for feeling they could turn up here at Rushall tonight and just carry Trev considering they’ve been the Pics bogey team for a good while and had beaten them 3-0, in the reverse league fixture at Kidsgrove, only three days prior to this. Yet, Rushall had spent the season hovering near the top, leading the division on a few occasions but falling away to sixth prior at this Easter weekend, whilst Kidsgrove languished in 17th, largely safe from relegation after spending much of the winter right amongst it. Despite opting for a Good Friday evening kick-off, a decent number have turned out from Kidsgrove for the night, especially if the flags are anything to go by. I’d forgotten in the years since my trip there of Kidsgrove’s fondness for a flag, it’s like the last night of the Proms every night for them, only with fewer bow-ties and jingoistically decorated bowlers. Speaking of cheap entertainment, the linesmen seem well up for it, stationing themselves outside the dressing rooms either side of their own in such a symmetrical fashion, they appear highly likely to squeal “ready? OK!” and break into a cheerleaders’ flag dance. If not that then could at least clash their flags together like a couple of eager Morris men counting the hours ‘til St George’s Day. It’s a decent evening for it though, after the rains of the hours before; “red sky at night, shepherd’s pie innit” said one lady with a chuckle. And so the game kicked off and the first half was extraordinary. Rushall took the lead in the eleventh minute, Kidsgrove’s Mitch Stenton and Tom Shwarz tackling each other in the box allowing Craig Fitzpatrick to dip between their limbs, pick their pocket and fire inside the near post. Within a minute though, Kidsgrove had equalised. A corner was floated in and the ball dropped by keeper, and 60’s beat-pop hero, Dave Clarke; a hasty clearance only went as far as Charlie Reeves who fired through the melee. 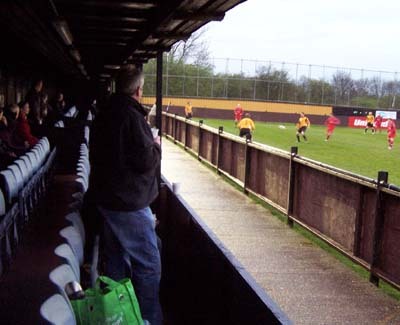 Rushall regained the lead with only sixteen minutes gone; Dave Hayward curled a free-kick over to the far post, Craig Marshall headed it back across and Niki Preston hammered it home. 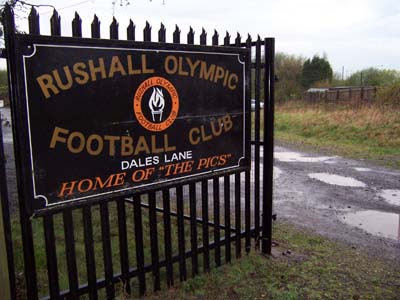 Only a further two minutes had passed when Rushall increased their margin. Marshall crossed into the box and Carl Palmer was on hand to turn his man and fire beneath the keeper. There then followed a ten-minute lull, at least by the standards of this game, before Rushall got their fourth. Hayward crossed in a free-kick and Marshall rose at the back to crash the ball in off the post. The beefy steward with the Mohawk and more metal in his face than his record collection (which, one assumes by his leather and studs look, is saying something), started a solo Mexican wave by raising his two crutches aloft over and over again. Not that Kidsgrove gave up as with ten minutes of the half remaining, Liam Shotton brought a sharp save from Clarke. Trevor Benjamin then sat on a defender’s back in trying to reach the subsequent corner, clearly believing this oppo flunky to be a sedan chair put at his disposal for the evening. On the stroke of half-time, Kidsgrove got a goal back; Tim Sanders’ free-kick, taken centrally, squeaked through the wall and the Clarke’s lettuce wrists. He needn’t have feared, as 4-2 it finished. 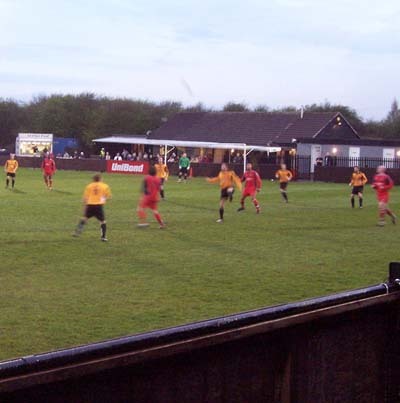 Rushall squeaked into the last play-off place with a 1-0 home win over Shepshed Dynamo on the final day of the season. This took them above Glapwell, who lost 3-1 away at Stamford. The sole factor in this late leap was a goal difference that was just one better than Glapwell. 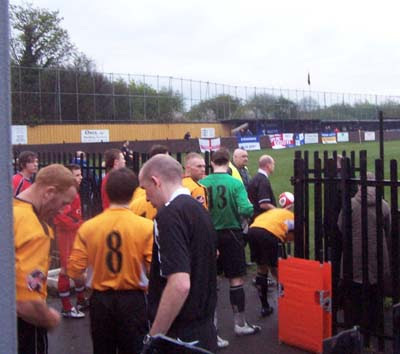 Not that it made much difference in terms of promotion as Rushall lost their semi-final 1-0 at Belper Town. Kidsgrove finished 15th come the end of their campaign.